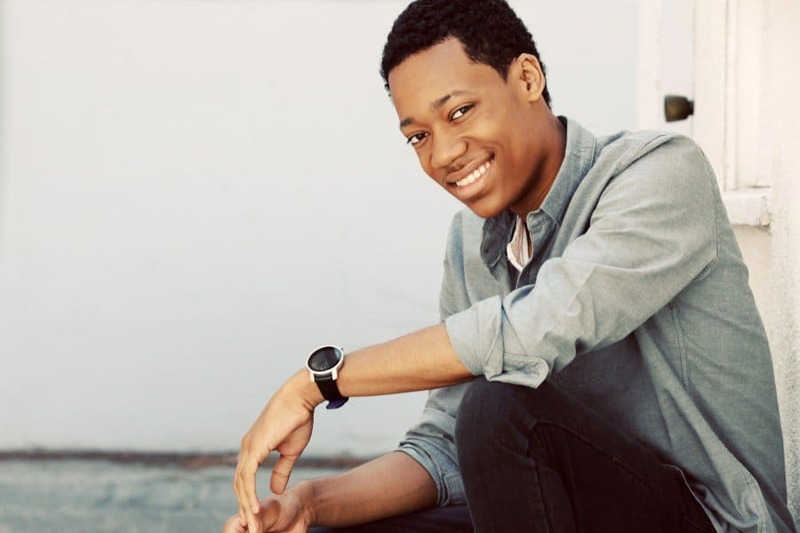 Tyler James Williams was born on October 9, 1992, in Westchester County, New York. This spring, he co-stars as Monty, a computer whiz, in Criminal Minds: Beyond Borders, a new CBS spinoff series. He has been busy, and early last year, he guest-starred as Noah in ten episodes of AMC’s The Walking Dead. He was also in Ballers, Comedy Bang! Bang! and Instant Mom. The year before, in 2014, he impersonated Steve Urkel on Key & Peele. That skit brought rave reviews and it was named the #1 sketch of the year by New York Magazine. Tyler wasn’t only active on small screens. On the big screen, he starred as Lionel Higgins in Dear White People, a satire about being a black face in a very white place. Dear White People was well-received, and at the 2014 Sundance Film Festival, it won the Special Jury Prize. The year before that, he was in Peeples with Kerry Washington and Craig Robinson. The Emmy Award-winning series Everybody Hates Chris is probably his best-known work. For that he received an NAACP Image Award for Best Actor in a Comedy Series, back in 2007. Roll forward five years, to 2012, and he was nominated for another Image Award, this time for his performance as a gifted rapper plagued by self-doubt in Let It Shine, a Disney Channel Original Movie. Tyler debuted at age 4 on the set of Sesame Street and he later co-starred in Little Bill,an animated series. On television he was also in Law & Order: SVU, and he was seen many times in Saturday Night Live sketches. An accomplished musician, Tyler recently released a mixtape with his brother Tyrel Jackson Williams titled Me, My Brother & a Mic. In this mix, the brothers satirize a number of entertainment industry issues that include conflict, mediocrity and women. His most recent work, which debuted April 20th, was starring in RePlay, a scripted time-loop series from New Form Digital. Below the video, Kam chats to Tyler. 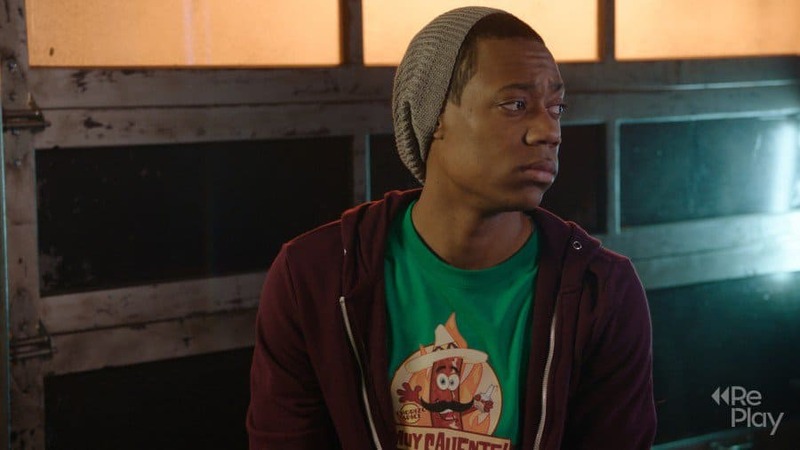 Tyler James Williams: Thank you, Kam. KW: What interested you in RePlay? TJW: I just really liked the story and I loved the movie Groundhog’s Day. KW: How would you describe the series in 140 characters or less? TJW: It’s DJ Allison Lee’s (Lyndsy Fonseca) 25th birthday party and she just HAS to impress promoters. She fails and wishes for another try. She gets 25 chances to get it right. KW: The premise does sound a little like Groundhog’s Day. TJW: Yes, I would describe it as a modern day Groundhog’s Day. I really liked RePlay because it wasn’t just Allison’s character that experienced a replay, but eventually her friends realize they are also reliving the same day. And it is interesting to see how humans would act if they knew there were never any consequences for their actions because the next day they could wake up and just redo it. KW: If you had an opportunity to repeat the most important day of your life until you got it right, would you? 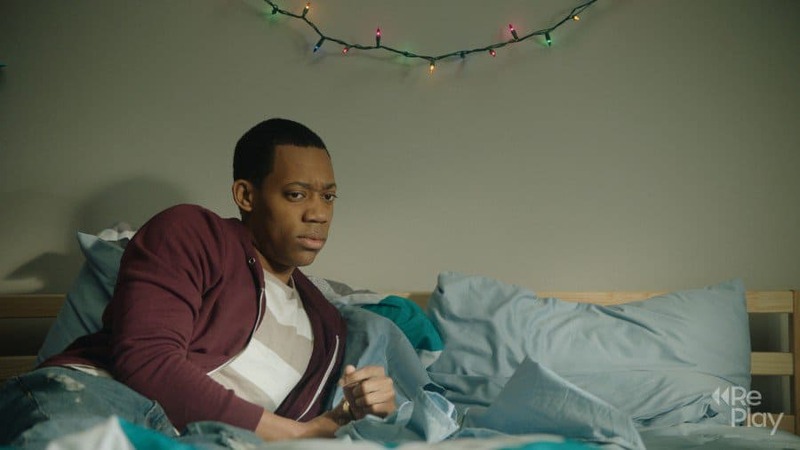 Tyler James Williams in a scene from RePlay. TJW: Oh man, I think I would. I would probably take a really bad date from when I was younger where just everything went wrong. KW: How would you describe your character? TJW: I play Nate who is Allison’s best friend, but he is secretly in love with her. He is in the “friends zone,” but really tries to get out of it. Each day, he gets a bit more desperate. TJW: I love breakfast food any time of the day. TJW: Well I remember everything from my days shooting Sesame Street. It was such an incredible experience. My mom also convinced me to steal one of Big Bird’s feathers, which I still have. KW: Sherry Gillam would like to know what is the most important life lesson you’ve learned so far? TJW: Patience, always be patient. I also believe everything happens for a reason. KW: What’s the craziest thing you’ve ever done? Tyler James Williams – a scene from RePlay. TJW: When I am in New York, I love going to a Chinese restaurant and ordering chicken wings and fries. KW: “Realtor to the Stars” Jimmy Bayan asks: What’s your dream locale in Los Angeles to live? TJW: I really like where I live in L.A. right now. I live in the Valley and I feel I picked a spot that has some New York aspects. There are diners and a corner store. TJW: Money and a hair tie for my personal trainer Jimmy. You never know when he needs to put it up in a man bun. [Laughs] I am really into fitness right now and trying to bulk up. KW: Thanks again for the time, Tyler, and best of luck with all your endeavors.